Downtown Phoenix has a Kimpton Hotel called the Hotel Palomar. If you are not familiar with Kimpton Hotels, they are considered boutique hotels and they tend to be very eclectic in decor and style. 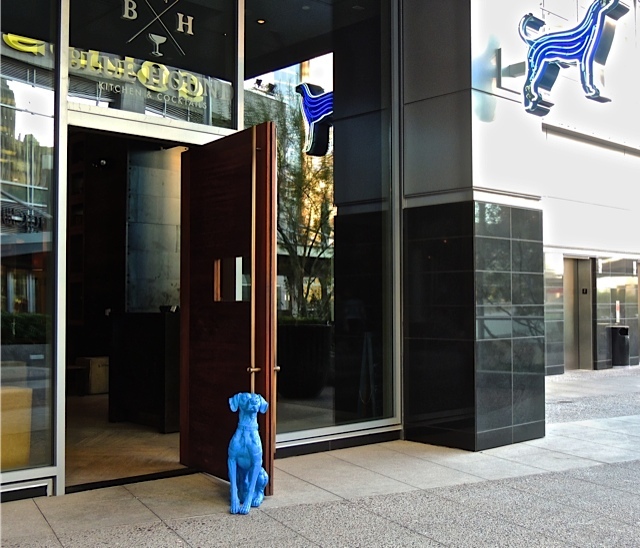 The restaurant at the hotel is called the Blue Hound. I've eaten dinner there once and had cocktails there a couple of times. 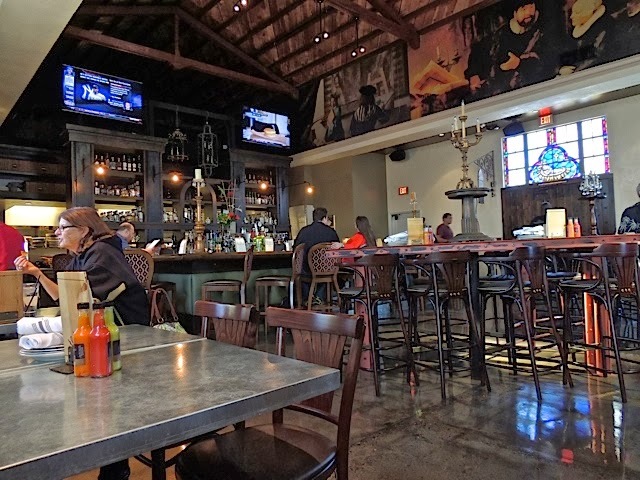 The food is good and the drinks are unusual and fun. 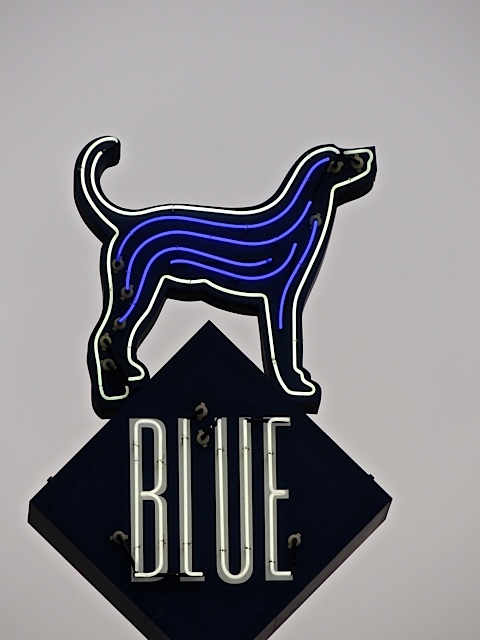 But, what I love the most is blue hound signage…..
….and the blue hound mascot at the door. 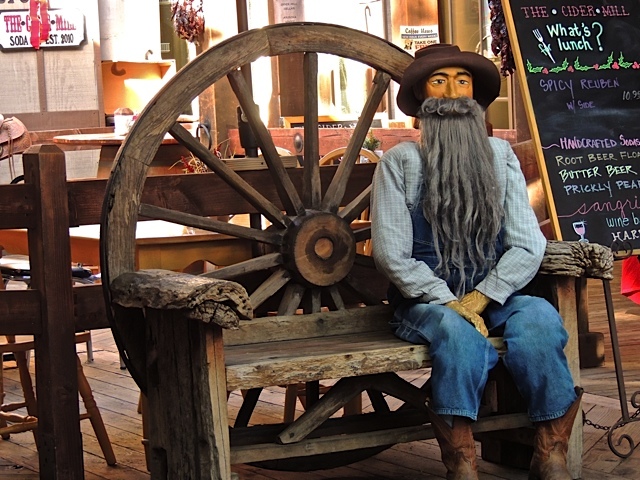 I spotted this old timer sitting on a bench in old town Scottsdale. I think he's been sitting there for a long time. He's looking a little glassy eyed! 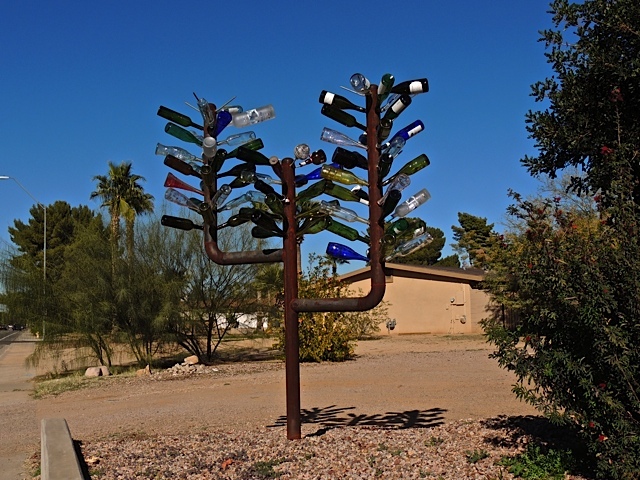 When I was driving to the Celebration for Fine Arts two weeks ago, I happened to pass a house in Scottsdale that had this bottle tree on the edge of the driveway. It was one of those moments when I have to figure out a way to turn around so I can get the shot. Fortunately, there was a place to pull over. It certainly is a unique piece of yard art. I don't think I'd want one in my yard. It's not that I don't have enough empty wine bottles, I just don't think it's my kind of art. 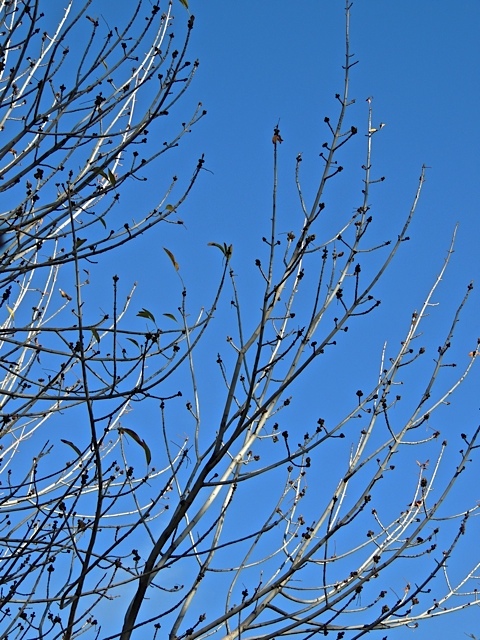 I looked up at those trees in my driveway on Sunday and was surprised to see the buds had started popping already. I really expected it to be another two weeks but, there they were. So, even I was surprised at how quickly they started sprouting. It won't be long and those trees will be full of leaves again. 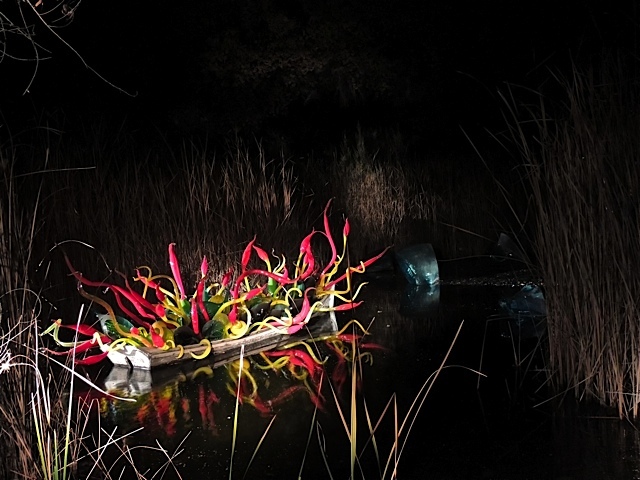 Here is one more shot from my night visit to the Chihuly exhibit at the Desert Botanical Garden. 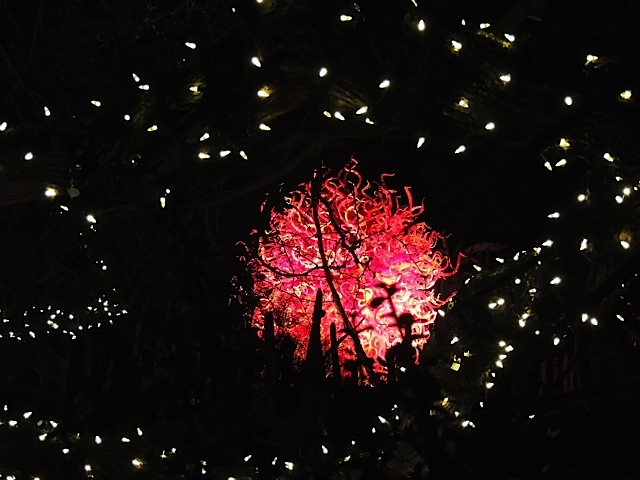 I took this one through the twisty branches of a tree that was wrapped in lights looking toward the giant fireball of this Chihuly piece. I was quite a distance away from the art work so there are a few plants and cactus between us but, I like the way it turned out anyway. I have a new post on Sharon's Sojourns today. My new travel motto is: Simplify, simplify. 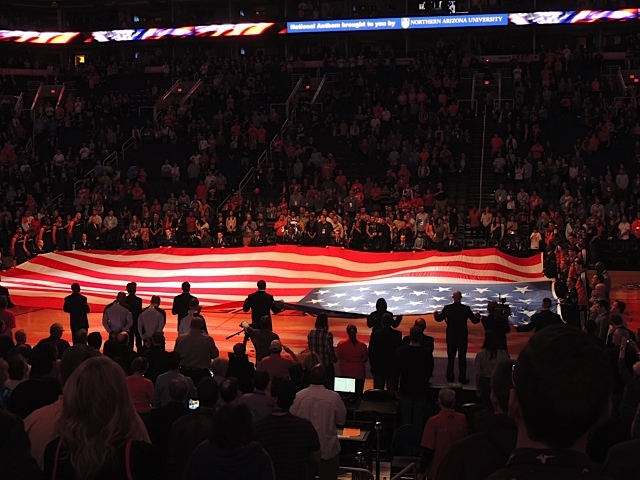 Friday night was Military Appreciation Night at the Phoenix Suns Game. The audience was full of the men and women who serve. It took a very large group of them to roll out this giant flag. 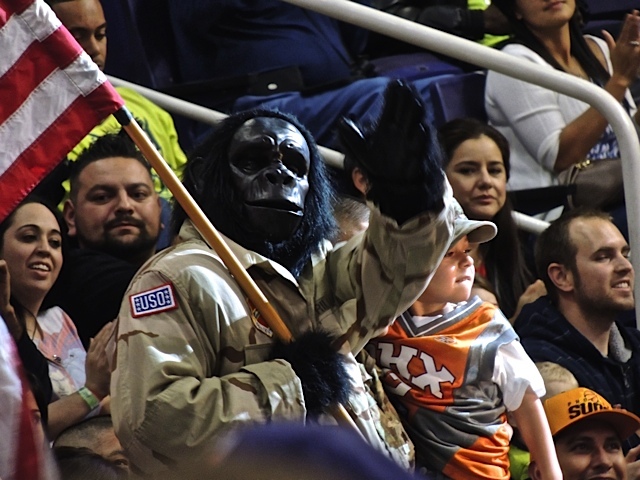 Even the Suns mascot "the Gorilla" was dressed in fatigues. It was a colorful night and a very close game that sadly, we lost. Thursday night I took another stroll through the Desert Botanical Gardens to get some more night shots. Dave of Tamarindo Costa Rica Daily Photo gave me a tip on how to take good night shots with my Nikon Coolpix camera and it worked beautifully. Gosh, that Nikon is a versatile little camera. I didn't limit my clicking to just the Chihulys, I experimented with some other shots too. 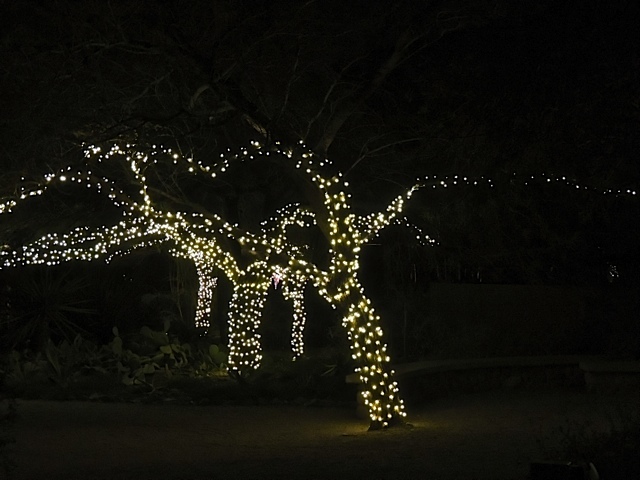 All these trees wrapped in lights were another target for my practice. 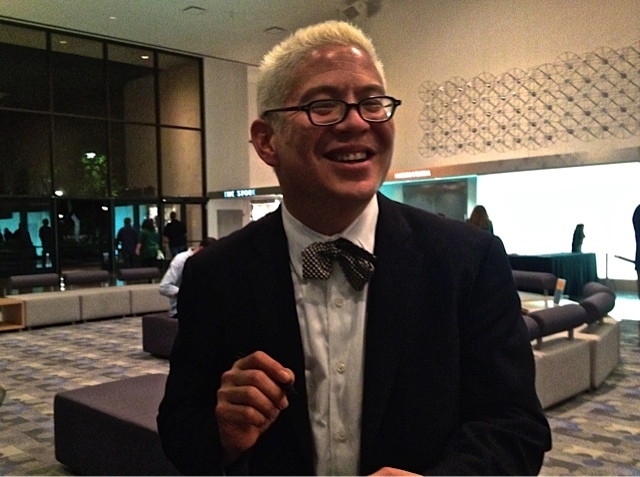 On Tuesday night, David and I went to see Pink Martini at the Scottsdale Center for the Arts and once again we loved every minute of the concert. Above is Thomas Lauderdale the piano player and group leader. After the concert, he and the other members of the group came out to the lobby to sign autographs and sell CD's. If you don't know Pink Martini, check out this song or something a little exotic like this song. They are one of my all time favorite groups. I've got all their music on my iPod and I listen to it frequently. In fact, I listened to it all the way to London on my flight back in November. I'm so glad I got to see them in person again. Since the Japanese Garden is close to my house, I took a drive over there on Sunday to take a quick walk. 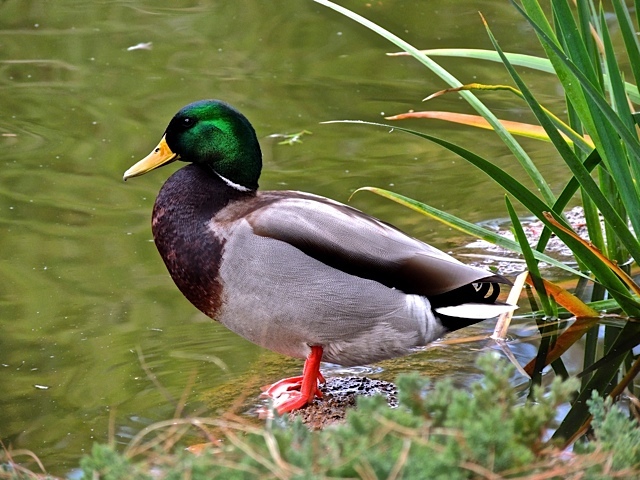 I found all the ducks quite active jumping in and out of the water and flying from one side of the lake to another and then landing in the water with a skidding and splashing action that was fun to watch. 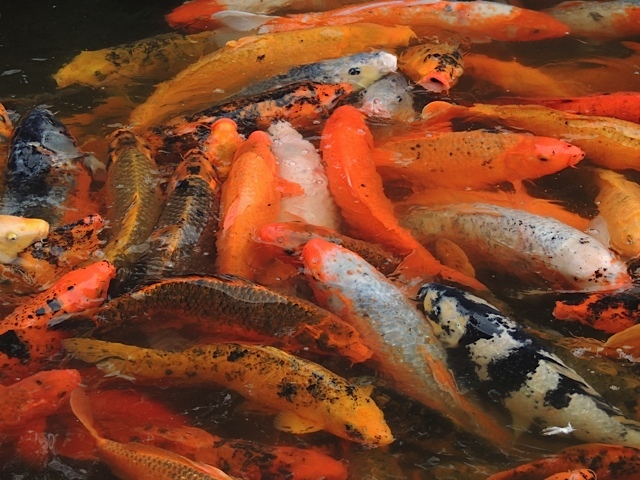 There was also lots of koi feeding going on. 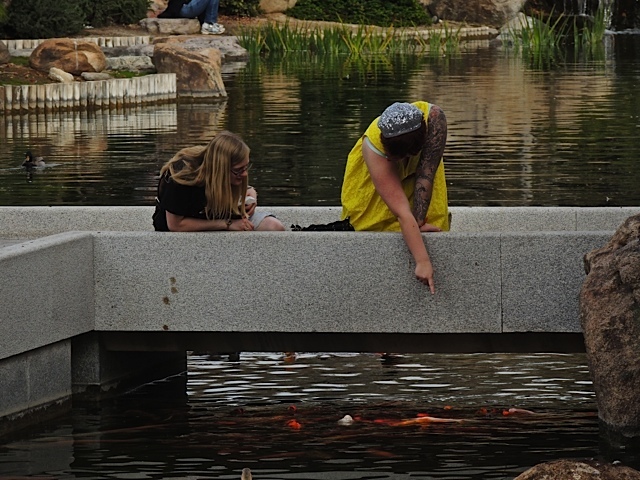 In fact, every time I'm there I see lots of people feeding the fish. No wonder they are so plump! 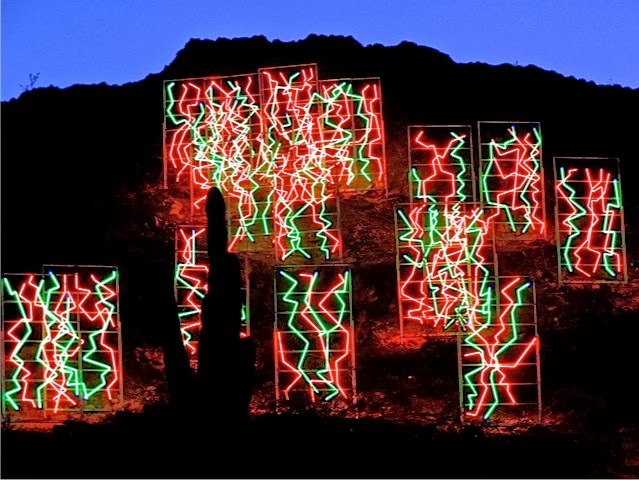 I made a night visit to the Desert Botanical Garden last week and I finally got a few photos of the Chihuly neon display that runs up the mountain that shadows the garden. Posting this photo has triggered a question. Has anyone else noticed that blogger automatically lightens nighttime photos when you post them? I had to post this photo four times, the last time after I added some heavy contrast to it in order to get it to look similar to what I took. It's still not right but, this is better than the first three. I don't know about you, but I wish blogger would let me edit my photos and not the other way around. 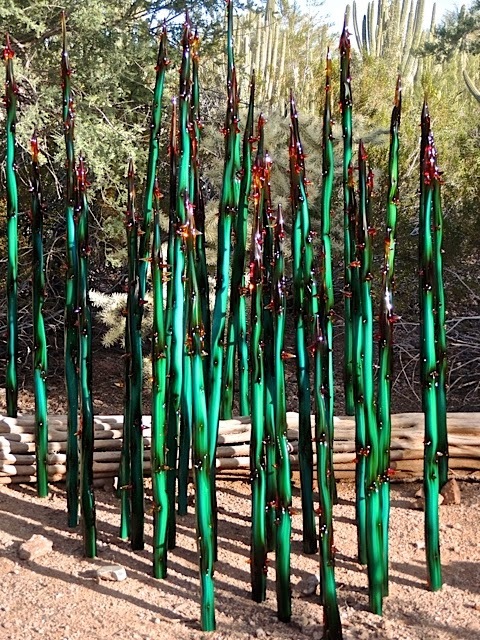 I decided to do a little photographic demonstration of the regeneration of trees here in the desert southwest. 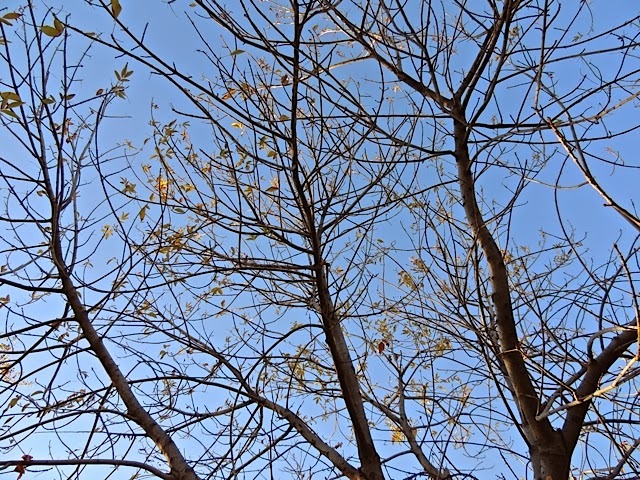 I've mentioned before that our trees start showing fall colors in December and start losing their leaves in January. Above is a photo looking up into one of the trees that line my driveway. As you can see the tree has lost most of it's leaves. 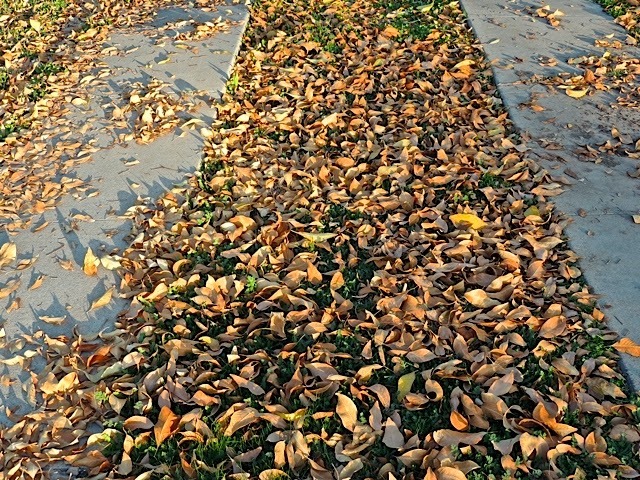 And, the proof can be seen in the carpet of leaves that now cover my driveway. 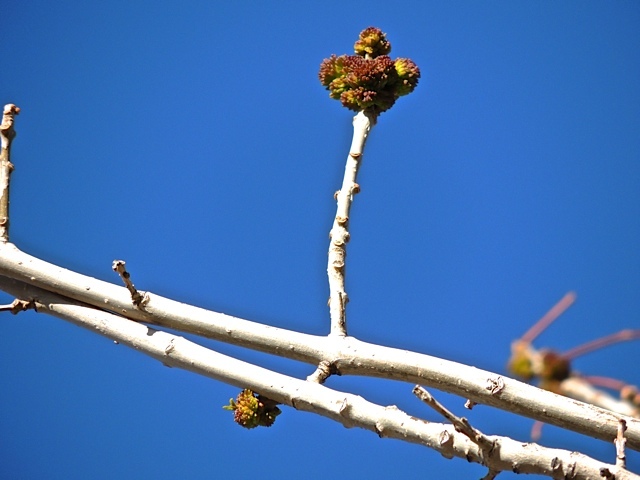 When the buds for the tree's new foliage start popping out, I'll take another photo to show you how quickly the trees recover from their winter hibernation. It's interesting to me how these plants have adjusted their lifecycle to the desert weather. On Saturday afternoon I went to the Celebration of Fine Art in Scottsdale, that art show that takes place every year in big white tents. 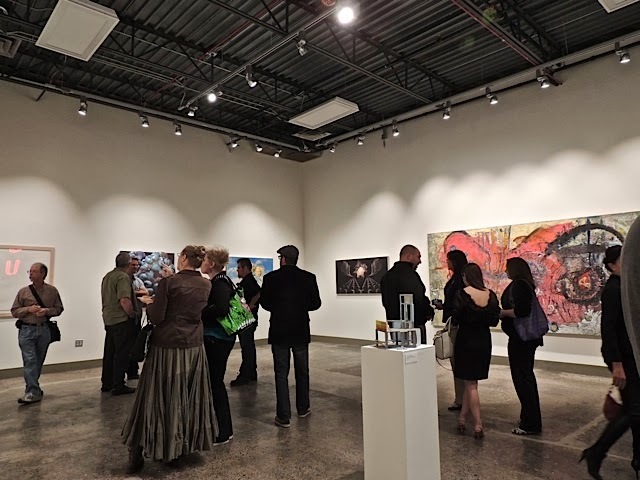 The show runs for three months with the artists in residence and creating while they show their work. This year I was again touched by a huge sculpture. 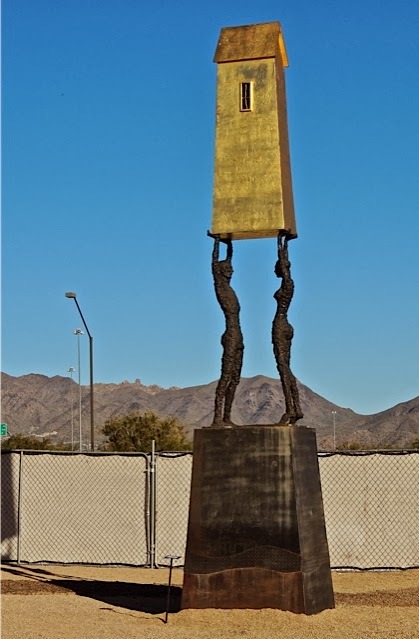 This one is called "Marriage" by William Barnhart. It's very tall and very striking. Here's a photo from a distance that will give you a better perspective of it's size. The show was again a joy to attend. I talked to several artists who I see there regularly and a few of the new ones too. So much beauty in one place. I love it. 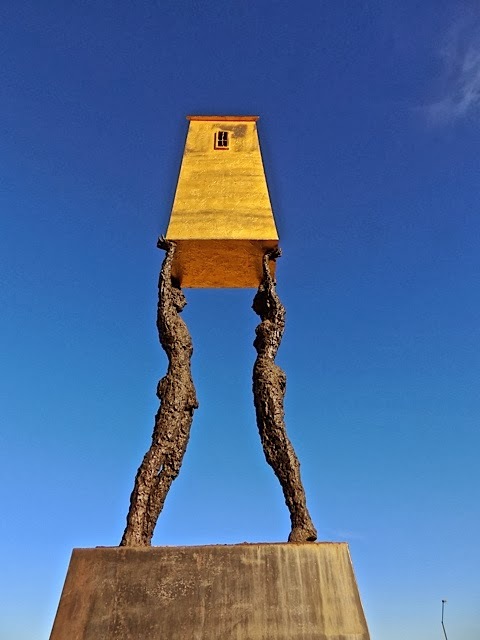 Do you remember this sculpture that I photographed back in 2010? I sure hope it has a good home somewhere. I'm hoping for the same for this one. Friday night I attended an open house celebration for the brand new Grant Street Studios, a new addition to the downtown Arizona State University campus. It's located just south of downtown in an area that I call the warehouse district in a wonderful old warehouse building. This will be the new graduate studio space where students who are pursuing their Master of Fine Arts degrees will be refining their talents and stretching their creativity and expressionism. I was invited to attend by fellow "Art Challenge" group member Peter Bugg who happens to be a Faculty Associate and Gallery Director at ASU. 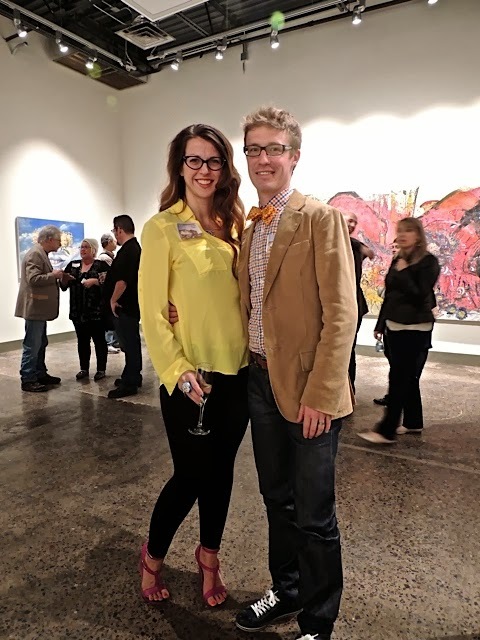 He's pictured here with his wife Melissa McGurgan who is Director of Outreach at ASU and a very talented graphic designer. When our "Art Challenge" group meets (during the summer months), I always look forward to Peter's interruption of the current challenge. 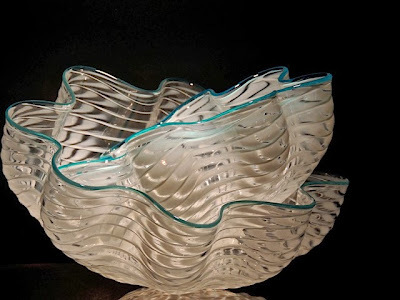 He is a very talented and exceptionally creative artist. You all know that I don't often approach strangers for a photograph but, I felt compelled to meet Mia at the open house. She's beautiful and stylish and the perfect model when surrounded by art work. I have a new post on Sharon's Sojourns today. It's a quick visit to the city by the bay. 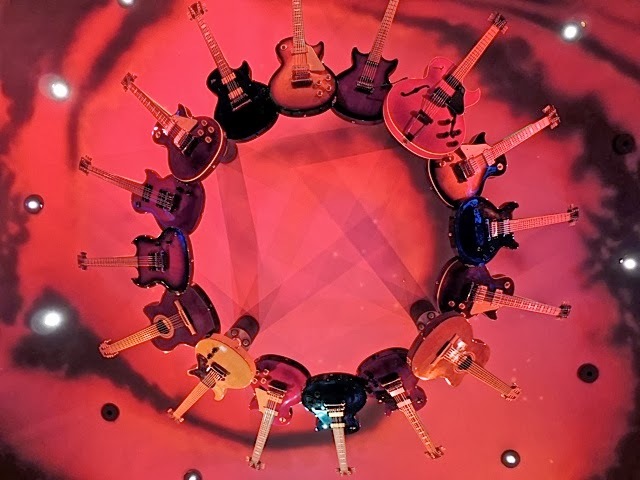 Can you guess what this is? No? 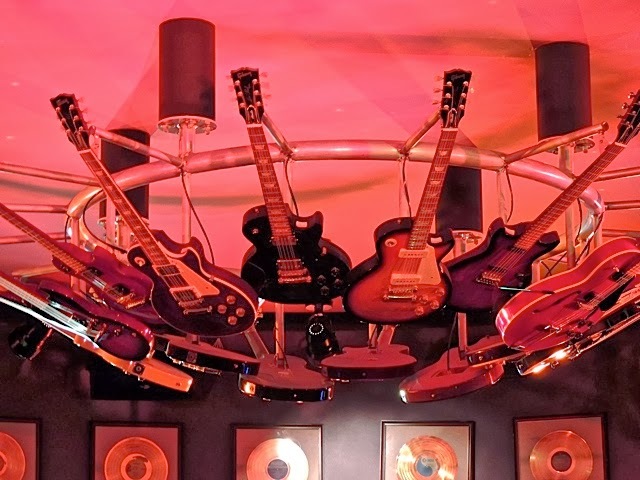 It's just the chandelier at the Hard Rock Cafe. Janet and I ate there before a basketball game last week. I love the top shot. I'd like to go back and take it again and use a bright flash to see if I can take the pink out of the shot. I found big chunks of ice on Central Avenue in downtown Phoenix on Wednesday. No, we didn't have a freak ice storm. Remember that ice skating rink I featured back on December 21st? 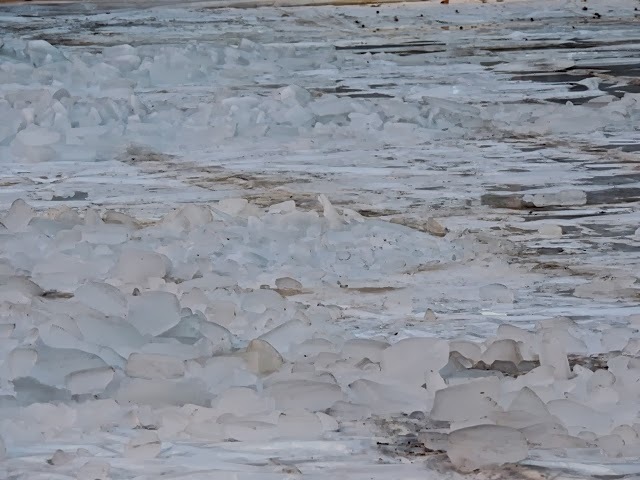 They were taking it apart on Wednesday and I happened to be there to see the ice all broken up on the street. My friend Janet who works downtown said they were using jack-hammers to break it up earlier in the day. 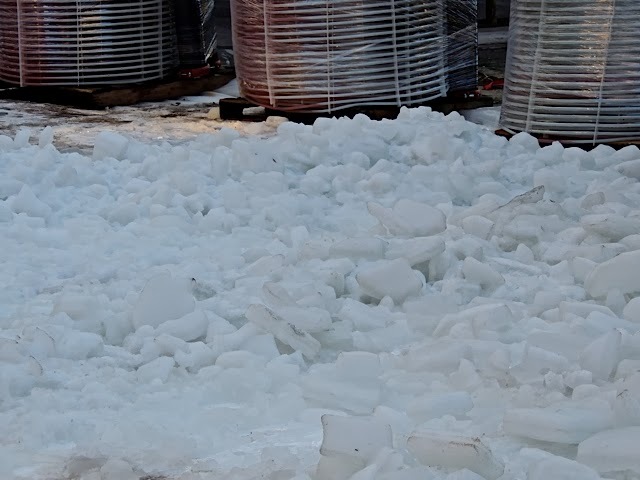 And, I guess they started jack-hammering while the freezer coils (pictured in rolls in the photo to the left) were still in place. I wonder how they manage not to damage the coils while hammering away at the ice. I went to the garden last week in the late afternoon so that I could see how afternoon light looked on all of the glass pieces. I was surprised to find a display I hadn't seen before. 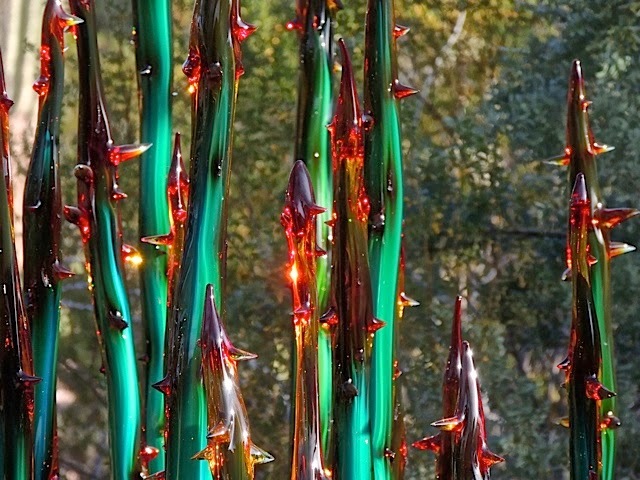 This one is called Jade and Crimson Thorns and I have to say I like it very much. It seems to fit in with the desert quite well. As you can see from this shot, it really does have thorns on it. 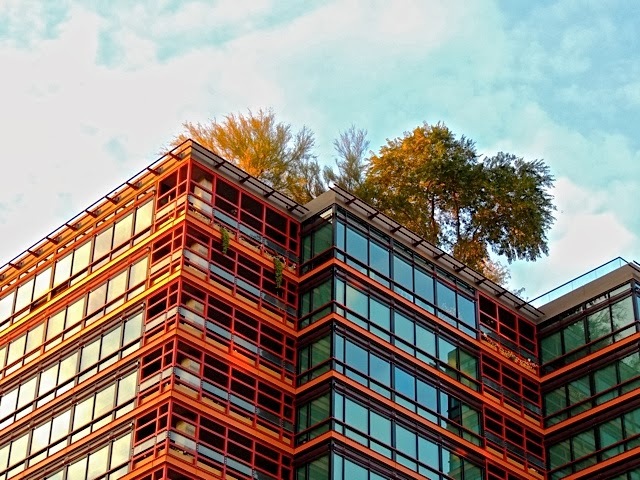 I've known that there was a roof garden on top of the Optima building but I just recently noticed how big the trees up there have gotten. I snapped this shot out the car window while I was sitting at a traffic light. I need to see if I can talk the management into a tour of that garden one of these days. 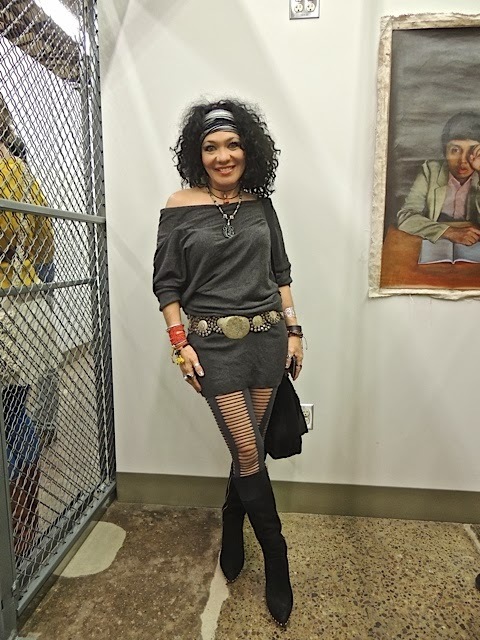 I have a new post on Sharon's Sojourns. I'm taking a break from England and instead visiting a Fool on the Hill. I met some friends for dinner Sunday evening in Scottsdale and since I arrived a little early, I took a stroll around the Civic Center park. I noticed there were several photo shoots going on there. I saw at least four different sessions in different places in the park. 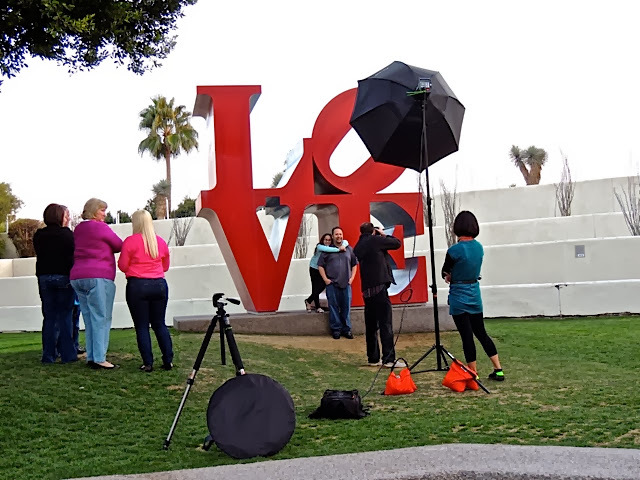 This one going on in front of the "Love" sculpture caught my eye. That's a great back drop for family, engagement, and anniversary photos. My sister commented yesterday that she was wondering what the outside of the Taco Guild looked like. I'm not sure why I didn't think to take a photo from the outside. It was the former Bethel Methodist Church and school and it was painted yellow when it was a church. It is considered a historic building since it was built in 1893. 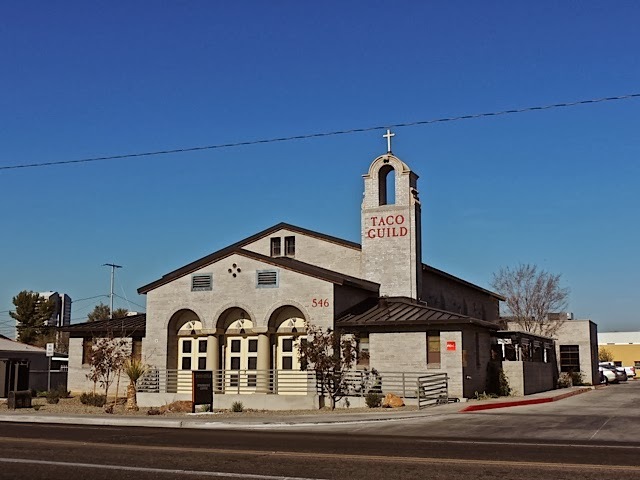 There is a new restaurant not far from where I live called Taco Guild and it's occupying a building that was once a church. They kept the stained glass windows when they remodeled and added their own church-like touches such as candelabras, angels and murals. They serve an interesting array of tacos in some very non-traditional formats like steak with blue cheese and lamb with creole aioli. I have a new post on Sharon's Sojourns today. This time I explore a cemetery from the Victorian era. I had to drive to Gilbert (a city on the far southeast side of the Phoenix metropolitan area) on Friday for an appointment so I took the opportunity to visit a park I've been hearing about. The Riparian Preserve at Water Ranch is so much more that a park. 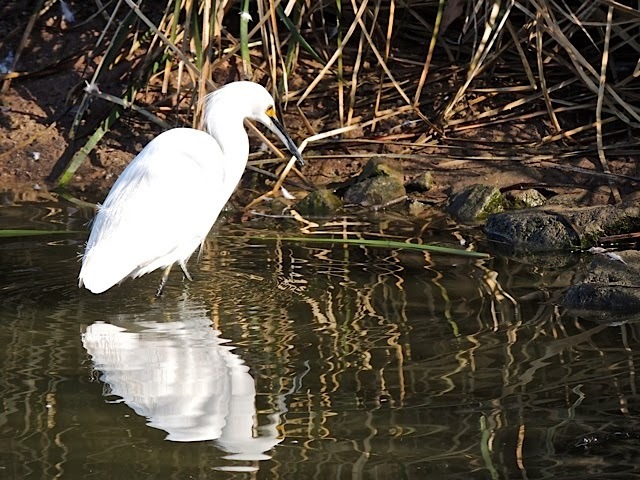 There are a total of 8 wetlands areas, many bird blinds, an observatory, picnic areas, walking and running paths, fishing spots, playground and probably a lot more that I missed. 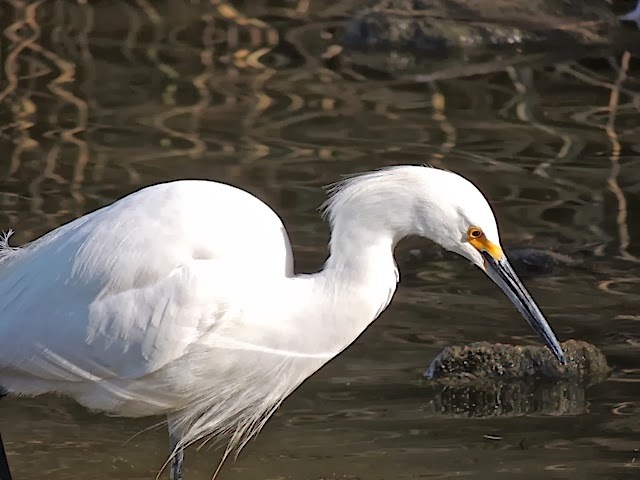 I walked around at least 4 of the wetlands and I saw many birds including this gorgeous snowy egret. In the photo above he's beautifully reflected in the water. In this photo, he strolled over closer to me giving me a chance to get an up-close shot. I'll have to make a trip out there again one of these days even if it is some 30 miles away across city traffic. I bought a bouquet of flowers last Sunday and by Tuesday, two of the flowers were drooping. The flowers must have been in the store longer than some I've bought before. 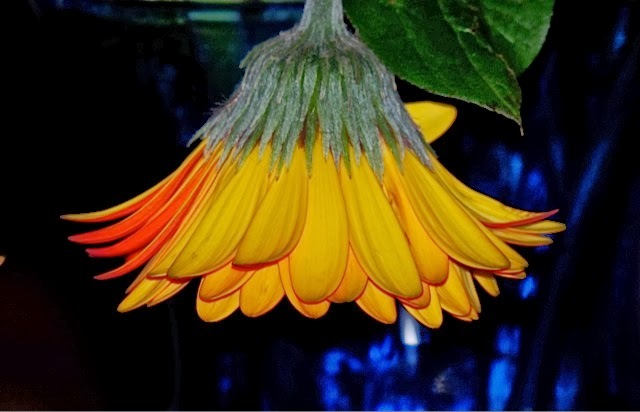 Since a drooping flower is what I had to work with, I photographed it anyway and I kind of like it. It looks like a ballet skirt or, I guess I should say, a tutu. 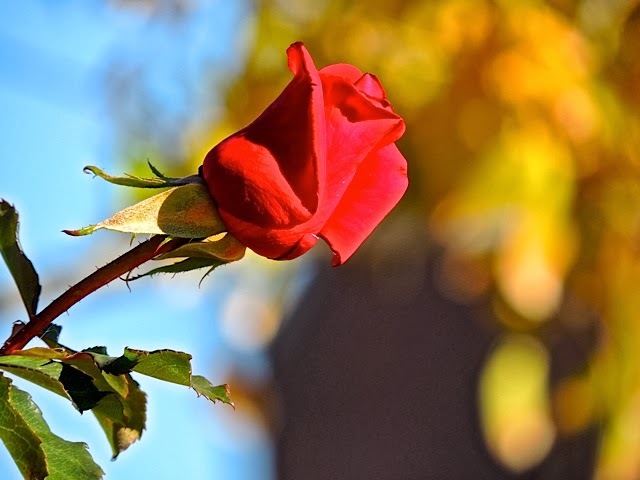 The roses are starting to bloom at Steel Indian School Park. I took a little walk there to see if they had any blooms and I was pleasantly surprised. I'll have to go back in a few weeks because I think the rose bushes will be full of blooms by then as long as the weather stays nice. I have a new post on Sharon's Sojourns today. What to do on a rainy day in London is the subject this time. I forgot about these photos I took a week ago. 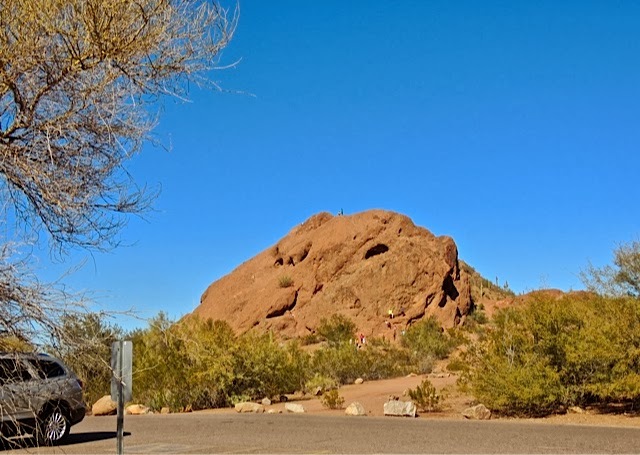 I took a drive to Papago Park and found park very busy with people picnicking, fishing, hiking and rock climbing. These two made it to the summit of one of the Papago Buttes. I took this shot to give you a better perspective of just how high up they are. If you look closely, you can see those two standing up on the top of the butte. Oh I wish I were an….. I bet you've heard that song before. 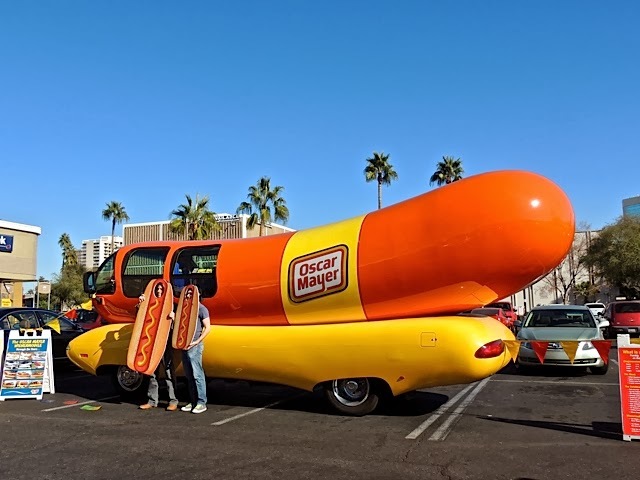 The Wienermobile was parked at my local Safeway store when I was there on Sunday and as you can see, people were posing as hot dogs in front of it. I didn't, but they did give me a cool whistle for stopping by. If I'm not mistaken, my sister Judy got to climb inside when it was visiting Prescott last year. I didn't get that offer. 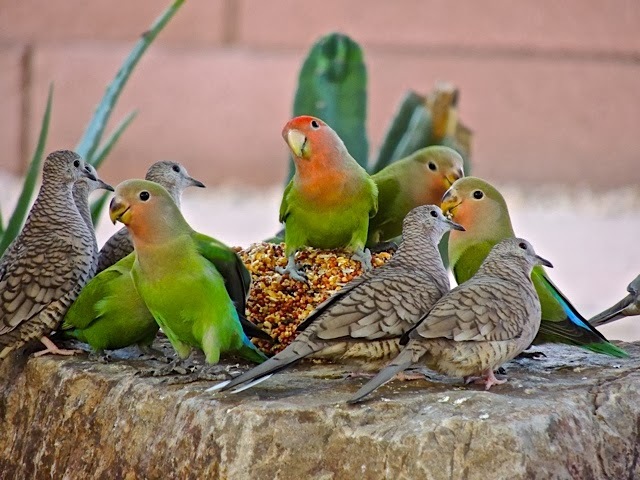 My favorite Peach-faced Lovebirds have been around lately taking advantage of the supply of wild bird seed I've stocked up on. 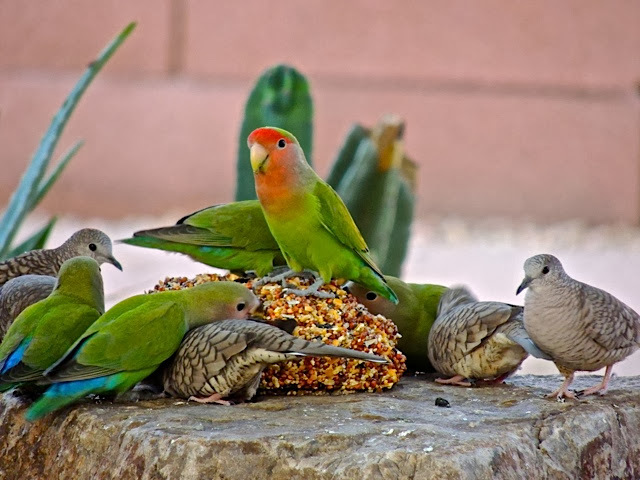 It's nice to see that they share their food with other birds in the neighborhood. This one appears to be wondering what I'm doing with that funny black box in front of my face. "Oh, it's a camera. I had better pose nicely so she'll buy more bird seed." 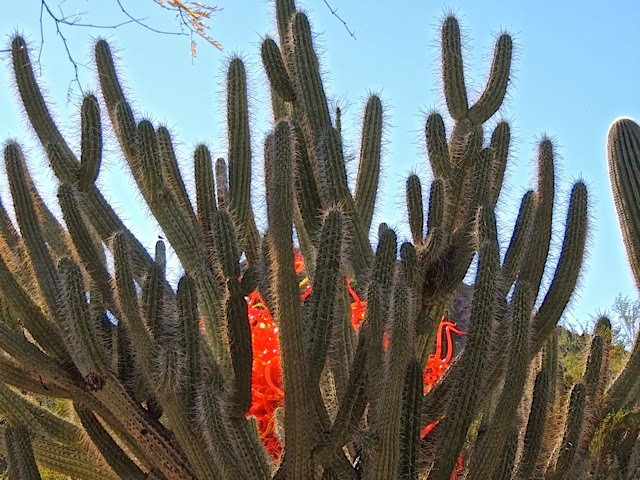 The Chihuly sculpture that is lurking behind this cactus makes it look like there is a giant fireball ready to engulf the desert plants. I have a new post on my Sharon's Sojourns site today. This time my journey takes me "Back to the Future". 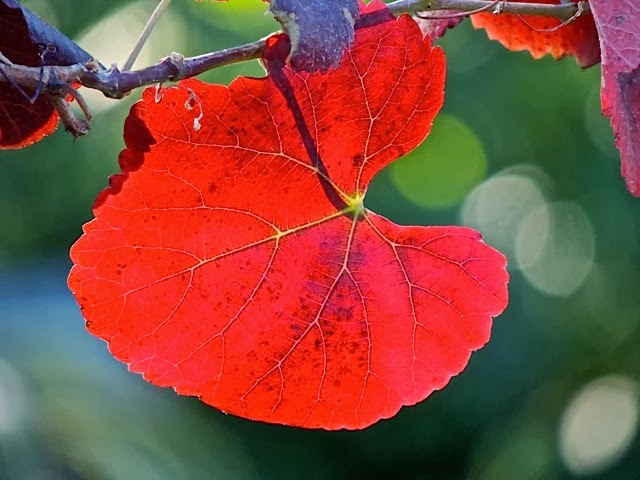 I believe this is a grape leaf although I can't be sure. It was really a deep wine-red color but the sun was shining through it and made it glow this brilliant fire-engine red. 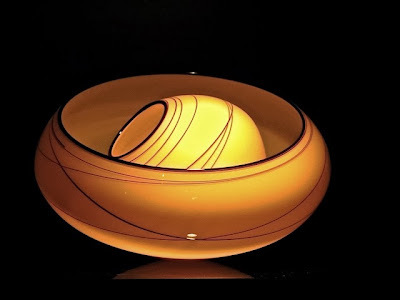 I mentioned yesterday that the Webster Auditorium at the Desert Botanical Garden had been turned into a shop for Chihuly souvenirs. In addition to the books, videos, T-shirts, and caps, there were also some exquisite collectors pieces for sale. …..if the prices weren't in excess of $7,000.00! This actually is the Eliot Patio of the Webster Auditorium at the Desert Botanical Garden. 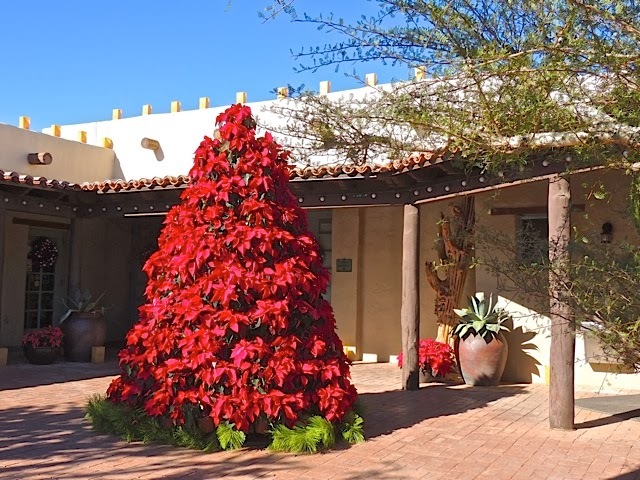 Construction for this adobe building began in 1939, a year after the state granted the land to the Arizona Cactus and Native Flora Society which founded the Desert Botanical Garden. Today the building is used for meetings, weddings and other events. 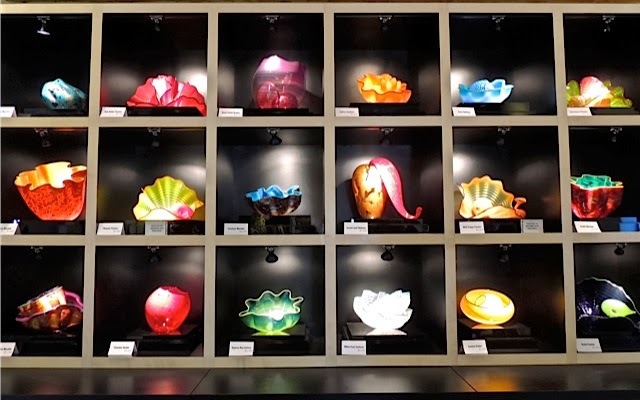 Right at the moment, they have set up a "Chihuly in the Garden" shop with all kinds of Chihuly related items for sale. When the garden isn't busy, I like to sit on this patio and imagine what it would have been like to live here in the 1940's. I went way back to January 17th of last year to pick my photo of the year. I had about 8 options available as I scanned my posted photos going back through the year but, when I got to this one, I knew it had to be the one. 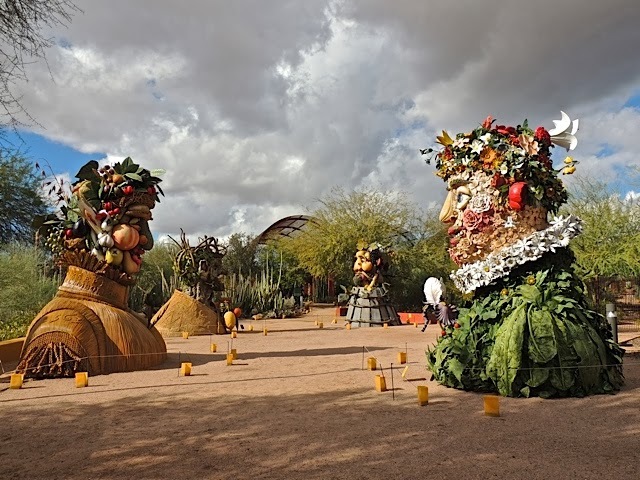 It encompassed all four of the four seasons sculptures by Phillip Haas but, more important, it had a fantastic sky. It also was published in a Polish magazine later in the year. Click here to see other "photos of the year" from other City Daily Photo bloggers. I have a new post on Sharon's Sojourns today. I'm checking out the other attractions in Brighton.